I usually get an email from time to time from someone who is experiencing wild pH swings in their hydroponic reservoirs. Growers usually tell me that their pH was around 6.2 one day and then 8.0 by the next morning or some similar story. This situation becomes a little bit frustrating as the grower does a huge effort to keep the solution at a certain pH level only to realize that after a certain time the pH of the solution simply starts to swing wildly between very odd values. In order to help new and experienced growers better understand the nature of these swings, what they mean, and how they can be eliminated for good I decided to write this small article on hydroponic pH swings and how variables different to plant feeding affect pH levels. Let's suppose you got home from work, prepared a new batch of nutrient solution and set your pH level at a very comfortable level of 5.7. By the next day, when you wake up in the morning to check your plants you find that the pH of your solution is 7.5. 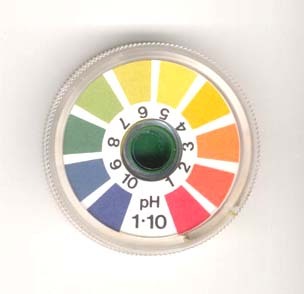 You start to argue with your pH meter, recalibrate, readjust your solution and leave for work. When you come back - to your surprise - your pH level is now around 7.3. What ? - you ask yourself - What could be wrong if you set the pH to 5.7 again and it again went up to 7.3 ? The answer to these wild pH swings comes from an understanding of the chemistry behind everything within your hydroponic system. Generally these swings towards high pH values are caused by media which has surface-active basic sites which act like "buffers" and readjust the pH of your nutrient solution to their own "preset" pH level. This is very much like the mechanism used by soils to naturally control pH, only that this time the minerals are playing against you. Substrates that have been made at high temperatures which have basic potential - such as rockwool - show this kind of behavior. Other media such as river bed gravel also show strong pH buffering effects due to their natural mineral composition. How do you end this problem ? The easiest way to end this problem is to pretreat your media before starting your crop. Place your media in a bucket and then add 1 liter of vinegar for every gallon of water. The media will attempt to neutralize the acetic acid and in doing so it will lose the proton capturing ability of its surface basic sites. Using a weak acid like acetic acid is better than using a strong acid - like nitric acid - because this ensures that residual acids within the media won't lead to other extreme pH fluctuations. After the media is soaked in the vinegar solution measure the pH, wait a day and measure it again. If there is no difference between both readings then you can now wash and use the media - if there is - then you need to wait another day and remeasure. Now basic media is not the only problem around. There are also wild swings to acid values which are usually a consequence of bacterial growth or dying organic matter. When organisms die or when they are being decomposed by bacteria organic acids - which lower pH - are released into your nutrient solution. Wild swings into the 3.5-4.5 region usually mean that the problem is not media but related to root disease. You should do a hydrogen peroxide treatment (check my articles on peroxide for more on this) and wait to see if pH levels stabilize after a while. In extreme cases, physical removal of dead root material may be necessary to correct the problem. Last but not least, the problem can also be related with plant feeding from a very scarse volume of solution. If you are handling less than 1 gallon per plant of solution in your reservoir then it is likely that plants themselves - through the absorption of nutrients - are causing the swings. This is easily fixed by placing a larger reservoir and ensuring that you are always recirculating at least 1 gallon per plant of nutrient solution. Hopefully with the above guide you will be able to better understand "wild" pH swings and take corrective action whenver you see this behavior happening within your hydroponic crop. can root decomposition raise the ph level in a hydroponics system? We have had the ph level raise to above 7 in an aeroponics system. P.H. Problems? Here's a good, quick read. P.H. Problems? Here’s a good, quick read.